If you’re looking for guitar lessons in North London you’re in the right place! 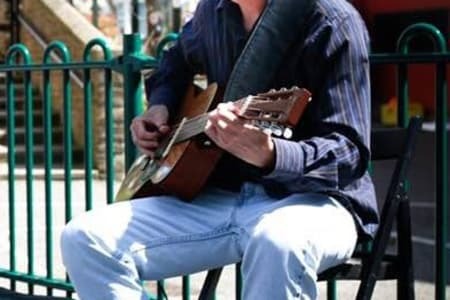 Aaron is a professional guitar player and teacher with over 15 years teaching experience. Lessons are mostly taught in his fully equipped home studio in Finsbury Park, Haringey N4 though, although home lessons are also available. 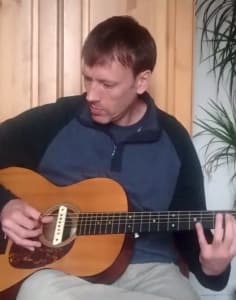 He teaches all levels and ages from beginners to advanced, and all styles of guitar are catered for. Typically students are about 50/50 fingerpickers and plectrum style, acoustic/electric. Learning is student centered; this means that a lesson plan will be developed depending on your own unique needs and goals. Students typically come from nearby Crouch End, Hornsey, Wood Green, Islington, Muswell Hill and Harringay, though some travel from further afield. Aaron has Grade 5 Music Theory ABRSM and can teach theory to this level. He prefers to teach the essential aspects of theory (what you need to know to play) as an integrated part of overall guitar tuition though.